This edition features song text in PDF format (words only, no music) to cut and paste for projection or in bulletins. Our Faith in PDF format is also included. This edition is not returnable. You are strongly encouraged to test samples before purchasing. Download samples at LiftUpYourHeartsHymnal.org. This hymnal includes more than 850 hymns, psalms, and contemporary and global songs, along with prayers and readings that can be incorporated into any church service. For worship leaders, Lift Up Your Hearts offers a broad selection of hymns and worship songs. In addition, there are more than 150 prayers and litanies. Resources for special services include morning, evening, and night prayers, and resources for pastoral care. Everything comes on a flash drive and is packaged in a small case. Due to the variance in projector strength, screen size, sanctuary lighting, and sanctuary size, we strongly encourage you to test the projection samples with your church's projection system. Note: the purchase of this digital edition does not grant you permission to reprint or project all of the hymns and songs contained on it. You are responsible for the proper licensing needed for copyrighted material. 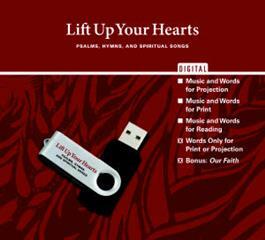 For more information and to view sample songs visit LiftUpYourHeartsHymnal.org.